EZ-Release Technology means NO MESSY GLUE or POPPING… EZ release cards when affixed to your letterhead adhere on all four sides offering the client the ability to personalize the card and letter in one pass through their desk top printers. EZ cards are an ideal way to draw customers into your mailing campaigns with special offers and membership incentives. 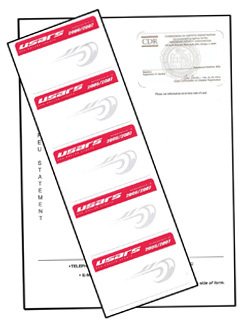 EZ cards are pressure sensitive for automatic affixing to carriers or promotional mailers so that the recipient can easily remove the card from the mailer with no sticky residue! The card is ready for immediate use or storage in a wallet. Perfect for membership cards, retail discount cards, and more. Available in Polyester, Tag Stock, Vinyl and Kimdura in a wide array of thicknesses.